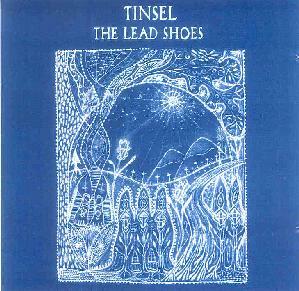 Tinsel - "The Lead Shoes"
This is the first full-length album from Michael Hopkins' solo project Tinsel. Michael is a Wisconsin based musician and on this release he throws open the gates to his very surreal and somber, yet strangely interesting world. This album definitely stirred a strange chord within me and it offered a lot of very well done dark and sometimes manic musical pieces. I hear shadows of Leonard Cohen in the songs 'Rebecca' & 'Sleep In Deep' for both are based upon the classic haunted Cohen style. Lesle Chalim's vocal accompaniments offer another dimension to Michael's tortured lyrics in both of these songs. Both are mainly Acoustic Guitar songs with strange atmospheres in the backgrounds and off key Piano's and Organ's sweep along with the occasional lonely Accordion or something. There is a lot of other dodgy stuff as well for Tinsel work weird soundscapes into most of the songs on this album, which I found perfect for their style of music. I loved the dark atmospheres and the conversations and the likes drifting in and out of ear range, similar to the stuff on Pink Floyd's 'Heart Beat Pig Meat' from The Zabriski Point Soundtrack. I can also hear a Ron Geesin sort of unpredictable noise element as well with 'The Halo Seeds', 'Eva's Window', and 'Golden City'. Ena Ballard's Viola on 'Golden City' is insane to the ears, and all three are out of it pieces of music whose motions are very acid induced. Sort of Noise Experimentation stuff, good for those seeking enlightenment through strange atmospheres and LSD. 'Keep Silent and Silence Will Keep You' is much the same while 'The Lead Shoes' has a sort of Cohen/Syd Barret approach to it. There is a Roger Waters style darkness in the songs 'The Great Indoors', 'Here I Was', and 'Rusty Symphony'. They all have their Ambience set firmly in The Wall era Waters. 'Empty Spaces' is a good one to listen to, to get a sense of what ambience I mean. All the Vocals are a mixture between Leonard Cohen and sad Roger Waters style Droning. Sort of One of My Turns in a Chelsea hotel type banter. On this 10 Track CD Tinsel offer 51 minutes of very Experimentation based sounds mixed with songs of a dark feel; they offer a lot in the respect of strangeness that draws obscure images inside the music. Its deep stuff that could possibly make you cry? I loved it and cannot wait to hear the next offering. Keep it up lad! For more information you can visit the Keyhole Records web site at: http://members.aol.com/keytapes. Email at keytapes@aol.com. And snail mail c/o Keyhole Records; PMB 358 - 2701B University Ave; Madison, WI 53705-3700 USA. Visit the Broken Face web site at: http://brokenface.exitflagger.com. Email at matsanna@mail.bip.net. And snail mail at Broken Face Recordings; c/o Mats Gustafsson; Hogbergsgatan 43B - Ltr 619 30 Trosa; Sweden.